Cyclamen coum is a winter wonder and an important member of our range of hardy cyclamen for sale. Their flowers look like little wings that are fully reflexed. They nose up through frost and snow to dance above the slenderest of stalks from December to early March. Whites and pinks - pale, cerise and deep - are their forte with a magenta blotch at the base of each petal, and they glow in a world of dormant twigs and branches. The dark green, rounded leaves precede the flowers and add a splash of interest amongst the browns of dying autumn leaves. The Cyclamen leaves can be plain or mottled with silver patterns like a Rorschach test, and are enormously attractive in their own right. In their first year, you will only see a few flowers but by the following year there will be a whole colony of flowers because each plant produces masses in its own right and then, a happy Cyclamen will self-seed like mad so you will soon be amazed at the slick of magentas and pinks you will acquire over the years. Amazingly, ants enjoy eating the coating of the seeds and so they carry away from the mother plant meaning that you can find new Cyclamen plants popping up in unexpected places. The preferred Cyclamen habitat is dappled shade in summer and a moist, leaf-mould soil in winter when it is flowering. Ideally therefore you plant them under deciduous shrubs or trees, including walnut trees, or in the shade of a garden fence or hedge, even a conifer one. This is propitious because these are often the very spots where little else will grow. They do need sunshine however so make sure you plant on the sunny side. Equally if the soil is too rich you will see masses of foliage at the expense of any flowers so do not be tempted to dig in manure or fertiliser when you plant. Poor, thin soil is the answer for the best flowers which is why you can tuck them between the crevices of oak and beech trees. 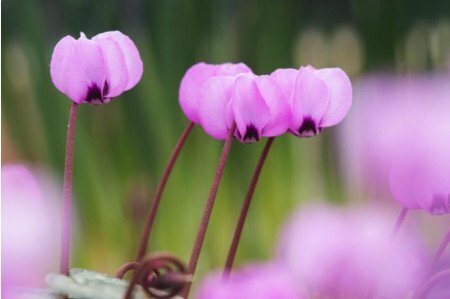 For most people, the generic Cyclamen coum is sufficiently interesting and pretty en masse on its own, and it will throw up unusual seedlings which you can then transplant once the tuber has developed. Cyclamenophiles can search out named varieties however and look for pewter leaves or the prized plants that have a dark edge and a silver tidemark to their leaves. If you wish to combine Cyclamen coum with other flowers then stick to snowdrops and crocuses which will not only look good but will not swamp them. Avoid planting more vigorous bulbs like Aconites or Muscari in the same area or they will soon take over and displace the Cyclamen coum. Cyclamen, appropriately enough, are relatives of our lovely primroses. They have similar ways of seeming to appear from nowhere and appealing to everybody. Hailing from Bulgaria, Turkey and particularly from Lebanon and Israel they are now happily integrated over here. Beware florist's cyclamen which are normally derived from Cyclamen persicum, are not hardy at all and so will not survive the ravages of our winters.